We recently had the privilege to take a peek at Pearl Izumi’s 2014 spring line, and so far we like what we see. One of our favorites includes the P.R.O. In-R-Cool Octane Tri Suit, which features Pearl Izumi’s transfer aero with in-R-Cool fabric and 1:1 patented sleeve construction. According to P.I., this is the most aerodynamic piece offered on the tri market. With that in mind, we did a little reading about P.I. Transfer technologies, which feature one-way capillary action and hydrophobic fibers to pull moisture away from the skin. In layman’s terms, this suit’s fabric will keep you comfortable while you’re hitting it hard in both hot and cool weather. In fact, P.I. boasts the fastest fabric dry time available. Fabric technology aside, we think this suit looks pretty amazing as well. P.I. also offers some awesome suits for the female triathlete as well. We loved the looks of the Women’s P.R.O In-R-Cool Tri Suit, which also features P.I.’s lightweight, friction-reducing fabric technologies. Meant to simply be pulled on and off, this suit does not have a zipper but does include a separate bra top for added support and easier on/off access. We thought this was a nice added feature. According to P.I., this suit is meant for all distance races. 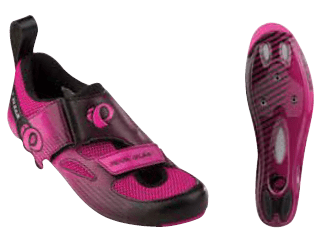 We also couldn’t take our eyes off the P.R.O series Women’s Tri Fly IV Carbon shoes. P.I. has improved on their Tri Fly Carbon shoe with P.R.O. powerplate and 1:1 anatomic triathlon closure system (TRI Closure). According to P.I., the TRI Closure eliminates hot spots and removes pressure from your forefoot. The Tri Fly IV Carbon also offers concave shaping for an ultra-low 7.0mm stack height. What’s more, our female editor couldn’t help but fall in love with the black and pink color scheme. 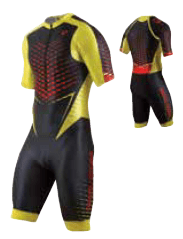 Did you happen to see what the other colors of PI Octane Trisuit for guys was? (They usually have 2 color schemes). Looks like you’re the only one with a photo of the new 2013 suits, well done. I’m sorry to say the Yellow was the only color scheme we remember. It really stood out on the floor of Interbike and is one the products we most want to spend time with long term. Are these women PI pink and black suits and shoes still available? If so, where can I order these form online and do they ship to Australia? “We did not bring the Octane suit forward for Spring ’15 as part of the inline collection. It is still available through custom. We found that most athletes at that level wanted to have a custom team piece, so we invested our efforts there. thank you for your reply greatly appreciated. I have noticed the 2 piece in singlet and short so I will try and source them in Australia if possible.